IBM Research – Zurich is one of IBM’s 12 global research labs. IBM has maintained a research laboratory in Switzerland since 1956. As the first European branch of IBM Research, the mission of the IBM Research – Zurich Lab, in addition to pursuing cutting-edge research for tomorrow’s information technology, is to cultivate close relationships with academic and industrial partners, be one of the premier places to work for world-class researchers, to promote women in IT and science, and to help drive Europe’s innovation agenda. Customizing hardware for AI applications has led to dramatic speed-ups for important workloads. IBM Research is advancing hardware beyond traditional CMOS to see how far we can push performance. Check out how it works with a simple MNIST demo on IBM’s one-of-a-kind analog AI chip. A taxi from Zurich airport takes 30 to 40 minutes and costs approximately CHF 100 (CHF 50 from downtown Zurich). It is considerably less expensive (approx. CHF 10 to 16) by train, see details below. 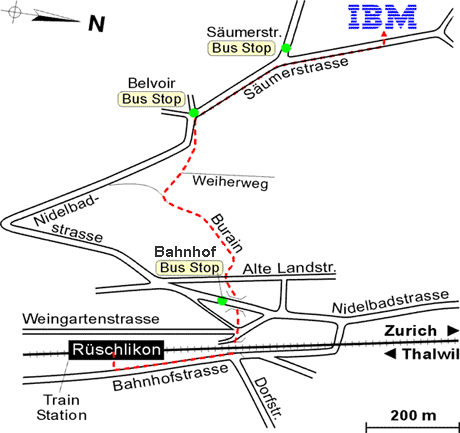 A bus from Zurich Bürkliplatz takes you almost to the door of the IBM Research – Zurich site in Rüschlikon, see details below. You can find information about public transportation around Zurich at the ZVV website. Please make sure you have a valid ticket before you board a train, tram or bus. You can get these tickets from vending machines or ticket counters at the Zurich Airport and Zurich main station. (On buses with 3-digit numbers you can buy a ticket from the driver if there is no ticket machine at the bus stop.) You must purchase a ticket prior to boarding S-Bahn trains (S2, S8, S24, designated by a yellow eye), and conductors check tickets on a random basis. You will be fined 90 CHF (plus the ticket) if you are caught traveling without a valid ticket—no exceptions made for foreigners. To use the older ticket vending machines, you have to enter the zip code of your destination. New models take cards, whereas older models take only coins and 20 CHF notes. They do give change. Timetables and fares for public transportation throughout Switzerland can be found here. Enter, for example, “Zurich airport” as the point of departure and “Ruschlikon, Saumerstrasse” as the destination. Upon arriving at the Rüschlikon train station from Zurich, walk back about 200 m towards Zurich. Pass under the tracks and under Nidelbadstrasse. Here you can either wait for the bus (the bus stop is directly over the underpass), or continue walking up the hill via Vordergasse, the narrow lane right at the bus stop. (Not recommended on icy days or for guests with luggage.) Cross Alte Landstrasse and continue up Burain lane. Take the right-hand fork at the top of the steps. Continue along the path and up more steps to reach Säumerstrasse, then turn right and continue to the IBM site. See schedules: Go to Timetables. Follow green signs “Zurich” — “A1 / A4 Nordring ” — “A3 Westring / Chur”. Take exit “Thalwil / Rüschlikon”. At end of ramp, enter the roundabout and take 2nd exit onto Eggstrasse. At the next roundabout, take the 1st exit (=turn right) onto Feldimoosstrasse, then left at the next intersection onto Säumerstrasse. Note to gps (sat-nav) users: The new Westring connection is not yet in many navigational systems. Please consult a map and set a via point such as “Urdorf” manually. Take exit “Thalwil/Rüschlikon/Adliswil”. At end of ramp, enter the roundabout and take the 1st exit (=turn right), following signs to “Adliswil/Rüschlikon”. At the next roundabout, take the 1st exit (=turn right), then at the 3rd roundabout, take the 1st exit (=turn right) onto Feldimoosstrasse, then left at the next intersection onto Säumerstrasse. Note that all cars using Swiss freeways (motorways) have to display a toll sticker called a “vignette” attached to the windshield. One can buy a vignette for CHF 40 at border crossings and customs offices as well as at gas stations throughout Switzerland. They are valid for the calendar year. This means that, although it is no problem to take, for example, a German rental car into Switzerland, you will most likely have to buy and attach a Swiss vignette yourself, because German cars do not necessarily have them. Please also note that most car rental companies charge a considerable additional fee if you return a German rental car in Switzerland. Here is information about the Swiss freeway vignette. To walk up the hill from Rüschlikon train station to IBM Research – Zurich’s site, pass under the tracks and under Nidelbadstrasse. Continue walking up the hill via Vordergasse, the narrow lane right at the bus stop (not recommended on icy days or for guests with luggage.) Cross Alte Landstrasse and continue up Burain lane. Take the right-hand fork at the top of the steps. Continue along the path and up more steps to reach Säumerstrasse, then turn right and continue to the IBM site.